Make yourself at home in one of the 18 guestrooms. Bathrooms have showers and hair dryers. Conveniences include phones, as well as desks and coffee/tea makers. Featured amenities include dry cleaning/laundry services, luggage storage, and a safe deposit box at the front desk. Event facilities at this hotel consist of conference space and a meeting room. Free self parking is available onsite. When you stay at Severnside Bed & Breakfast in Malvern, you'll be within a 10-minute drive of Malvern Theatres and Great Malvern Priory. This 4-star bed & breakfast is 4.3 mi (6.9 km) from Malvern Museum and 7 mi (11.3 km) from Worcester Racecourse. Make yourself at home in one of the 2 air-conditioned rooms featuring flat-screen televisions. Complimentary wireless Internet access keeps you connected, and digital programming is available for your entertainment. Private bathrooms with showers feature complimentary toiletries and hair dryers. Conveniences include complimentary bottled water, and both refrigerators and irons/ironing boards are available on request. Located in Malvern, Holdfast Cottage Hotel is within a 15-minute drive of Herefordshire Beacon and Malvern Museum. 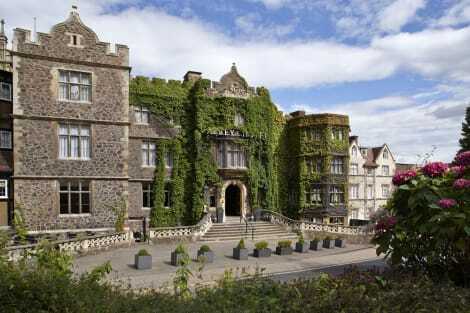 This hotel is 14.4 mi (23.2 km) from Wye Valley and 4.2 mi (6.7 km) from Great Malvern Priory. Overlooked by the Malvern Hills Area of Outstanding Beauty to the west, and overlooking the picturesque valley of Britain's longest river, the Severn, to the west, is the charming spa town of Malvern. This settlement has earned an enviable reputation for its impeccably clean Malvern water, which has been a favourite choice for numerous monarchs over the centuries, from Queen Elizabeth I to Queen Victoria and Queen Elizabeth II. Dating back to the Norman period, Great Malvern Priory is known for its extraordinary stained glass windows, and benefited from successive refurbishments in the 19th century. One of the pioneers of its renovation was Sir George Gilbert Scott, a prominent Gothic Revival architect who helped safeguard many other famous British landmarks such as the Foreign and Commonwealth Office and part of St Pancras Station. A beloved public park, the Winter Gardens has been an acclaimed concert venue for several decades, and is the site of the popular Malvern Splash pool leisure centre. The park also features the famous Malvern Theatre, which first opened in the 1880s and showcased many plays by the distinguished Irish playwright George Bernard Shaw. If you're up for a little challenge, consider walking to Worcestershire Beacon, a 425m high hill offering outstanding panoramic views of the surrounding countryside of Worcestershire and Herefordshire. The hills offer many miles of well-preserved paths, contain some of the oldest rocks in the country, and were a much-loved cycling and walking destination for one of Britain's most eminent composers, Edward Elgar. Consider visiting the Holy Well, which probably contains the world's oldest bottling plant, or enjoy some refreshing snacks and coffee at the historic St Ann's Well Café. Learn about the history of the nearby city of Worcester's formidable porcelain industry at the Museum of Royal Worcester, and see the site of the Battle of Worcester, the final battle of the English Civil War. Another fantastic, family friendly attraction in the Malvern area is the Three Counties Showground, which organises numerous major events throughout the year, from the RHS Malvern Spring Festival to the Malvern Autumn Show. For some delicious French food, try L'Amuse Bouche Restaurant, or choose the Mackenzie's Diner Restaurant for other superb American-themed dishes. If you're after some vibrant Thai flavours, dine at the Thai Rama Iv Restaurant, or consider The Inn at Welland for some mouthwatering British cuisine in a gastropub setting. For an affordable venue in a charismatic atmosphere, book a stay at the Foley Arms Hotel or the Mount Pleasant Hotel. Other excellent Malvern hotels include the luxury Colwall Park Hotel, The Cottage in the Wood, and The Abbey Hotel in the centre of the town.